Barber himself has been visible on the streets and on TV this year, with Mayor Sandy Stimpson, walking door to door to hear from residents about the problems in various communities. Their walks are part of a larger effort to help spur community engagement in some of the higher-crime areas. A larger focus on community engagement, along with intelligence-led initiatives in communities and “hot spot” policing, are some of the biggest changes Barber made after he took office in 2013. It’s a change in the way the department had handled crime in the past, he said. Barber said his new way of doing things, which targets offenders and smaller geographic areas where a majority of the crime takes place, encourages participation from community leaders and has helped the department’s relationship with the public. He’s also claimed success getting the department’s “house in order.” Barber, a former internal affairs sergeant, immediately began fighting misconduct within the department and holding his staff more accountable. Having been on the job for more than a year, Barber said those issues are no longer a problem. In addition to those changes, Barber is also in the midst of five-year plan to bring in new equipment, including patrol vehicles, to the department. Barber, who grew up in Mobile from the age of 4, graduated from Davidson High School. From there, he served in the U.S. Marine Corps for three years, serving with Fleet Marine Force Pacific. He said the Marine Corps helped him in his career in law enforcement. “You know, the Marine Corps is one of those organizations that’s just — failure is not an option in that organization,” he said. After his military stint, Barber attended the University of South Alabama as a criminal justice major and business administration minor. He received a master’s degree in public administration from what was then Troy State. He started his career with the MPD nearly 27 years ago as an officer after graduating first in his class at the academy. 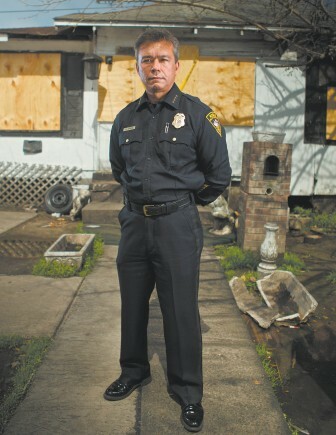 He worked his way up through several divisions and precincts before becoming assistant police chief. He was appointed chief by Stimpson in 2013. He now lives in Mobile, with his wife Faith. He has two daughters. Barber said Mobile can become the safest city in America by 2020, as long as it’s a team effort. “It can’t be done by the police department alone, which is why interagency cooperation, community engagement and this multifaceted approach is so important,” he said.